A sophisticated, full-featured continuous acquisition module for research. 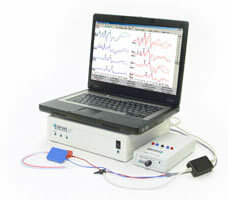 SmartEP-CAM, is the most flexible platform for the acquisition of EEG and Evoked Responses. Continuous acquisition of up to 8 channels. Freeze the screen, zoom, or move down the timeline. Create an average based on your parameters. Export high resolution averages for analysis. SmartEP-CAM is available exclusively for the Universal Smart Box. Please contact us for additional information. Download the brochure and learn more about the acquisition of evoked potentials and otoacoustic emissions with the unparalleled flexibility of the SpartEP-CAM software.